During the weeks of Lent, we have been looking at ways in which the arts express our faith and inspire us with hope. We’ve heard poems and stories, sung hymns, eaten bread, and moved our bodies in an expression of reverence, and finally in this last week of Lent, we turn to the most classic of arts — painting and sculpture — and since today is the beginning of Holy Week, I’ve decided to focus specifically on how the crucifixion has been represented in art. Before I begin, I want to preface this by saying that the wonder of the internet is that with only a week of research, a person can sound like an expert in most any subject but in spite of that, I am definitely not an art historian. If you want a more thorough and educated treatment of today’s topic, I refer you to a presentation online by the Right Reverend Lord Richard Harries of Gresham College in London 1 from whom I borrowed a lot of today’s material, and also to the research of Yale art historian Felicity Harley-McGowan. The second thing I want to note is that all of the paintings and sculptures I will be showing you today are by men. I tried to find some examples by women artists but of course, just like the church itself, church art historically was dominated by men. Finally, I want to point out that while all of what I am going to say is interesting from a historical point of view, it’s also important to our theological understanding of the crucifixion. The way in which artists depicted Jesus was heavily influenced not only by the culture of the time, but also by the theology of the church in the era in which the painter or sculptor lived. And conversely, the way people thought about Christ was influenced by the images they saw of him in the art of the day. If I asked you, for example, to draw a picture of Jesus, most of you would probably draw him with long hair, olive skin, a beard, and a pensive expression on his face, because this portrait of Christ done by Warner Sallman in 1940 hung in many churches and homes of our childhood. If you have difficulty thinking of Jesus as angry, or laughing, or even dirty from the dusty roads of Galilee, it may be because he is ingrained in your head as Sallman’s quietly reverent man gazing into the distance. There has always been a constant interplay between the theology of the church and the artists’ interpretation of that theology. So, let’s look then at the ways in which the crucifixion has been depicted by painters and scuplters over the last 2000 years and what that art has said about the meaning of the cross. [Slide of anchor on walls of catacombs] This slide is one of the earliest pieces of “Christian art.” It is from the Roman catacombs, underground burial sites outside of the city of Rome, and as you can see this painting found on one of the walls uses symbols to represent Jesus and the cross. The fish symbol represented Christ because the first letters of the Greek phrase, “Jesus Christ Son of God Savior,” (Ἰησοῦς Χριστός, Θεοῦ Υἱός, Σωτήρ) spelled out the Greek word for fish, and the anchor was a symbol of hope in the ancient world, and so here is used to represent the cross. Although Christian art and scenes of Jesus’ life emerged as a genre in the 3rd century, the crucifixion was not a regular subject of that art until the 6th century. Until then, artists used symbols to represent Jesus’ crucifixion. Most historians believe this was because the crucifixion itself was initially an embarrassment to the church. Crucifixion was a slow, agonizing, and humiliating way to die reserved for criminals and scoundrels, and pagans mocked Christians for worshipping a crucified man. The crucifixion was, as Paul said, “a scandal” to the church and consequently, artists avoided the topic, choosing instead to represent it in symbolic ways. So, so far, we have Jesus depicted in these early centuries as the vigorous athlete, already victorious and rising from death even as he hangs on the cross, and Jesus as our high priest, making our salvation possible through his sacrifice, and a third theme that is found in the early Medieval period is that of Jesus as king. This was especially common in metalwork crosses, many examples of which can be found England, Norway, and Scandinavia. [Slide of the Lothair Cross.] This theme was often adopted by the rulers themselves who wanted to promote their authority through a connection to Christ’s kingship. Emperors and kings often pledged to imitate Christ’s humility, obedience, and compassion for the people under their authority. This is a picture of the German Lothair processional Cross made in 1000 AD and set in the center is a portrait of King Lothair II, King of Lotharingia which comprised present-day Netherlands, Belgium, and parts of Germany and France. [Slide Gero Cross] All of these themes — Christ as victor, Christ as priest, and Christ as King — emphasized the divine aspect of Christ while downplaying his humanity. This began to change around 1000 AD when artists started to consider the suffering of Christ, and they began to produce images that are more familiar to us today. We see the beginnings of this transformation in the Gero Cross from Cologne carved in 975. This cross is six feet tall, carved in oak, and painted and partially gilded in gold. (The halo and cross-pieces are original, but the Baroque surround was added in 1683.) Notice in this cross that Jesus’ suffering is more evident. His eyes are closed, and he is slumped a little, more clearly dead than in previous renderings. It would take another couple of centuries for this new way of thinking about Christ to dominant church art because just as artists struggled to figure out how to show both his crucifixion and his resurrection as two parts of one event, so too they struggled to figure out how depict Jesus as both human and divine in the same portrait. How do you show the suffering of Christ while also showing that he is not just any guy hanging on a cross but is the son of God? Soon, however, we see artists shift from favoring Jesus’ victory and divinity to emphasizing his suffering and his humanity primarily as a result of the influence of the new Franciscan and Dominican monastic movements that arose in the 1200s. [Slide of Man of Sorrows] In this period, a new depiction of Christ emerged which was called, “The Man of Sorrows.” The man of sorrows is a phrase derived from Isaiah 53:3 which says, “He is despised and rejected of men; a man of sorrows, and acquainted with grief.” The Franciscan and Dominican monastic orders were founded during the 1200s as an attempt to bring a deeper spirituality to the people, to get away from the massive bureaucratic institutional church that had grown up over the centuries, and bring the gospel back to its more simple beginnings. Both orders developed an almost mystical devotional life that was centered on the sufferings of Christ. The members of the orders were encouraged to imagine themselves actually present at the crucifixion of Christ, meditate on his trials and torments, and see his agony as the sacrifice he made on behalf of his love for them. In these depictions of the crucifixion, Jesus is not only dead but is emaciated and wounded, the prints of the nails dominating his hands. [Slide of Mattias Grunwald] Throughout the Middle Ages and into the Renaissance, artists painted increasingly vivid portraits of Christ’s crucifixion, in excruciatingly detailed, melodramatic scenes. This piece is by Mattias Grunwald, a German artist, from the central panel of an altarpiece done in 1512. Note the tortured hands and feet, the muscles stretched to breaking, and the multitude of wounds on Christ’s body. If you were able to look at this close up, you would see Jesus’ body is covered with either wounds or drops of sweat, and his mouth is crusty from thirst; Jesus here is a very human man who has suffered terrible agony in his death. This trend toward emphasizing Jesus’ human agony became the dominant way of thinking about the crucifixion for centuries — think about all of the crucifixes hanging in our churches — and one could argue it continues to be seen today in places like Mel Gibson’s movie “The Passion.” The emphasis is on our redemption through Jesus’ suffering. 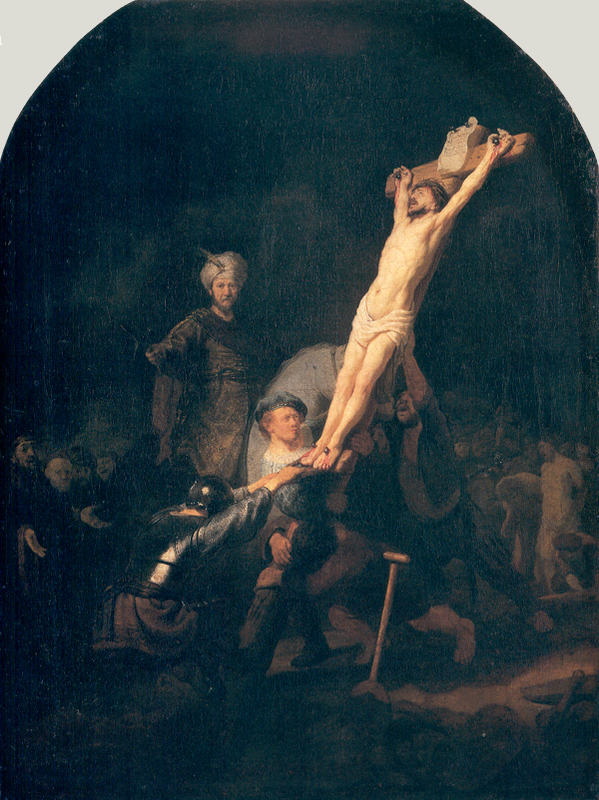 [Slide of Rembrandt’s passion] The famous artists of the Baroque period such as Caravaggio and Rembrandt used dramatic lighting and realistic figures to continue the emphasis on Christ’s humanity, but in this 1633 painting by Rembrandt, the artist brings the devotional element to the front of the scene. If you look in the crowd participating in Christ’s crucifixion by lifting his cross, you’ll see that the central figure is wearing a blue beret, obviously not a style found in first century Jerusalem. This is a self portrait of Rembrandt himself there helping to raise the cross, and most art historians interpret this as Rembrandt’s meditation on his own sinfulness and guilt before the cross. Christ died for him. Of course, to show you how art can be interpreted in many ways, I read one article that claimed “the scene is a visual metaphor for the struggle in Rembrandt’s own mind to create his painting,” to lift up into reality his vision of the crucifixion. [Slide of Delacroix passion] That personal intimate portrait of Christ on the cross was also well suited to the world view of the Romantic painters in the 1800s. Although most Romantic painters concentrated on landscapes, a few such as Eugene Delacroix (ooo-JEN de-la-cwa) painted the crucifixion; Delacroix actually painting it many times. In this work, Christ’s death is very solitary and the setting is stark. Delacroix focuses not only on the human suffering of Jesus but also on the personal relationship between the Savior and the saved. Jesus looks directly at the viewer and his expression is very poignant and caring. [Slide Chagall’s passion] In the 20th century, art took a modernistic turn and depictions of the crucifixion were often highly symbolic and abstract, dealing with the meaning of the crucifixion in a more social context. Marc Chagall was Jewish and painted Jesus in his Jewishness in this painting from 1938 called “The White Crucifixion.” Jesus is shown wearing a Jewish prayer shawl and on each side of him, Chagall has painted Jews fleeing from violence and oppression. Chagall deliberately chose to paint the cross in the center because the cross was something that Jews had come to associate with their own oppression, and so here Chagall transforms the cross into a representation of Jewish suffering. Jesus suffers with his people. Pope Francis has said this is his favorite painting. [Slide “Good Friday Menorah”] Another modern piece from 1993 again blends Jewish and Christian themes; this is a painting by Roger Wagner called “Good Friday Menorah.” It too is highly symbolic and like Chagall’s painting, plays with both the historic antagonism of Christianity toward Judaism and depicts their intimate relationship. 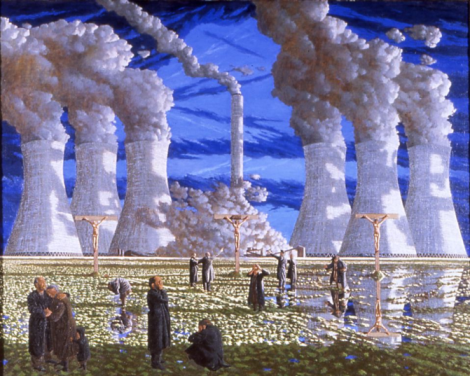 I won’t go into all of the symbolism here but the nuclear power plants in the background are in the shape of a Jewish menorah, in front of them are the three crosses at Calvary, and in front of that are people in despair and grief. Like many modern pieces, Wagner’s depiction of the crucifixion focuses on its meaning not in a personal context but in a societal context. Instead of the heavily devotional art of earlier periods and the emphasis on a personal savior, artists today often use the cross symbolically to convey observations about social issues and interactions. [Slide John Reilly’s resurrection] And so in a way, art has come full circle. It has returned to a more symbolic representation of the crucifixion and a message of its’ larger significance in the world. And interestingly, it some artists have returned to that ancient attempt to show the character of Jesus as both human and divine, trying to find innovative ways of communicating the inseparable nature of the entire passion event. This painting by the English artist John Reilly shows Jesus’ death, and the darkness of the tomb on the right, while on the left, he is already rising into a dance of color and light. Good Friday and Easter are two parts of one whole. So what does this all say about hope? I called our Lenten program on faith and the arts, “The Art of Hope,” looking at ways in which the arts express our faith and give us hope for our lives, for our world, and for the future. In reviewing the ways in which painters and sculptors have represented the crucifixion, what we have seen is their understanding of how we as people of faith can find hope in Christ. The early artists who showed Christ as vigorous and dynamic even in death remind those of us who struggle with our fear of mortality, who grieve the deaths of our loved ones, that life is never ending and that God breaks the chains of death to bring us into eternal life. Those who worried that God is so distant and so different from what our minds can comprehend that we have no way of bridging that gap between human and divine found comfort in the image of Christ as priest, paving a path to God through his death on the cross and his mediation on our behalf. And those who suffered under the oppression of unjust rulers and cruel emperors proclaimed that their rule was not the final say; that Christ is our King and his kingdom will prevail. When we commit ourselves in allegiance to hum, one day the hungry and the thirsty will be satisfied, and the meek will inherit the earth. And those who are in pain, who suffer the anguish of illness, trials, and grief, who struggle with their own failures and sinfulness, can take heart in a Christ who is intimately acquainted with our sorrows, who knows full well what we endure and who forgives us, loves us, and promises to be with us even to the close of the age. And those who despair at the wars of the world, at the bigotry and cruelty and stupidity which seems to be the lot of human society, can take hope in a Christ who enters our world to stand in the midst of the turmoil of our society and call us to a new way of living together. Each of these artists found their hope in a different aspect of Christ and the meaning of the cross. To ask which representation is right is to ask the wrong question because the tremendous power of the cross is that it incorporates all of that. Christ is the alpha and the omega, the first and last, in whom each of us can find ourselves and know the comfort and salvation that he offers. And so the question is not, which one is right, but which one brings you hope right now in your life?